Welcome to TownCraft. A quaint and casual game for you to relax to. So here you are, smack bang in the middle of two kingdoms with nothing to your name. Gather resources from the world around you and build yourself a town for others to envy. Let the construction begin! TownCraft doesn’t really have a story, not surprising considering the type of game it is, though it does have some vague details. You are back in the days of olde, making your way in the medieval wilderness. You desire to build a kingdom of your own and elevate it to a status of great revere. To the west lies King Oligarchy, a narcissistic king, and to the east is Queen Omnibus, a warrior who ‘tames’ surrounding kingdoms with her sword. You sit in the middle. Each of the three available maps also contains story elements of their own. Eden’s Valley takes place before the King’s Feast, for which you must help prepare, whilst Lake Placid and Rock and Pool have you fending off impending threats. These scenarios alter the dialogue of the travellers you happen by and change the quests that they present you. Does this seem like a fire hazard to anyone else? 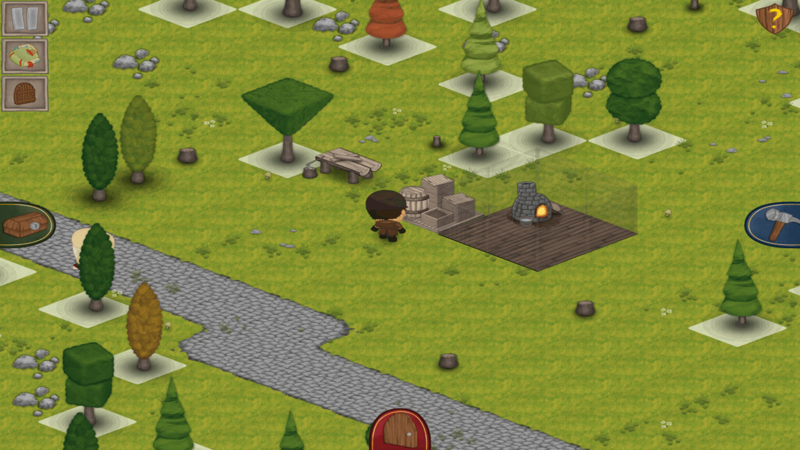 TownCraft has a fairly simple playstyle, especially to those familiar with sim builders. Search the land for material, meet the requirements for building and then…build. To begin with, the game features a tutorial mode that provides a step by step walkthrough for the basic principles of the game. 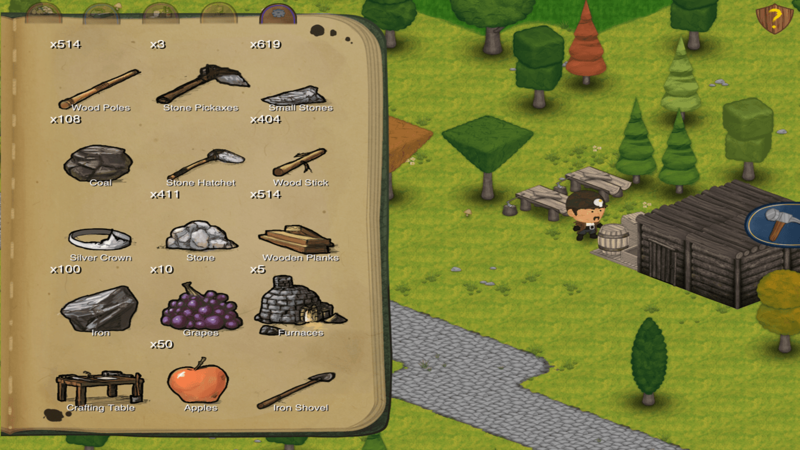 Starting from crafting your very first hatchet, the tutorial progresses into more complex elements, such as gathering the materials for a house. The tutorial is not compulsory, so you can skip straight into the game if you so desire. Once you feel confident enough in your TownCraft knowledge, you can progress to the game proper and begin your own adventure. Stranded once again in a wilderness, it its up to you to forage and craft without a guide. However, unlike tutorial mode, all building options and menus are available from the outset. As you progress, you gather handy recipes, detailing what components are needed to build an object, in case you ever forget. As your town upgrades, NPCs can be found wandering the main street. These characters engage in general conversation and may pass quests for you to complete, such as gathering twenty pieces of wheat. These characters may also join your young community, setting up shop in…well, your shop. You are then able to purchase their wares in your ever going quest of civilisation. Following its own style as a true casual game, TownCraft also possesses a cheat option, a fairly rare option in games nowadays. In the pause screen, simply hitting cheat will endow you with a plethora of items, saving you a lot of time and work. If you’d rather build your palace from the get go, one click is all you need. Also included in the pasue menu is the option to spawn the various NPC classes. With these option combined, you can go from a stick to a hustling, bustling city in a manner of minutes. It means timidness. He’s a jerk…and his name is Iceberg. TownCraft has a very simplistic art style to it. The player character is a chibi, giving the game a cartoonish and casual air. The world itself also gives off a very clean vibe. As the world is divided into square tiles, it appears very organised and, once again, simple. The clean blues and greens create a visually soft world, with even the reds and oranges scattered throughout the map being subdued. The game allows you to truly appreciate the visual, via the menu option that allows you to turn off the menu interface. You are also able to view the area far beyond where you’re character is currently standing, allowing you to simply watch. The game has a very pleasant and slow paced soundtrack behind it. As you journey through the wilderness, mellow tunes play behind you. Piano, acoustic guitar and flutes are used to create a calm atmosphere. Most notably, the music activates during certain events, such as the flute beginning when day breaks. More often than not though there will be no background music whatsoever. TownCraft is casual gaming to the truest extent. No advertisements, no micro-transactions, no “rate this game” pop-ups. Nothing but the game. There is no sense of urgency involved at all, allowing you to play at your own pace. The mechanics are simple and there is a fairly wide variety of objects to gather, mine and build. 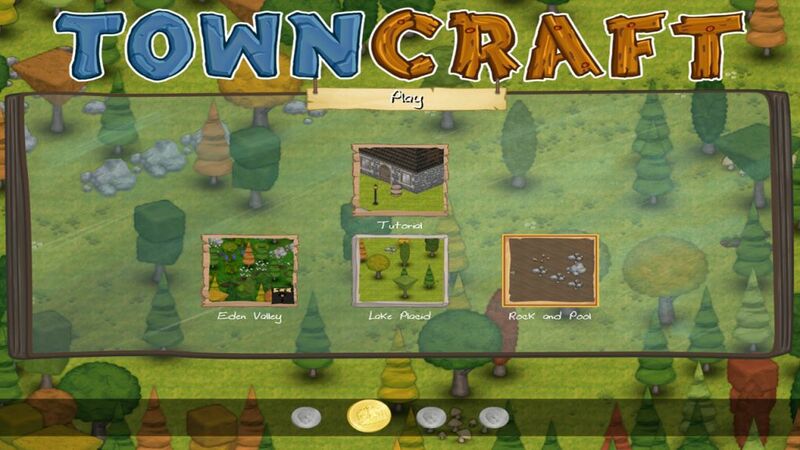 All in all, TownCraft is a game that lets you sit back, relax and enjoy.